He is hardly back to square one but, with his second season as Manchester United manager a few hours old, it is clear that Louis van Gaal still has much to ponder. This time last year, in the Dutchman's first game in charge, United suffered an opening-day defeat against Swansea that contained clear signs of the issues that would haunt him all season. The result was far better this time around, but the unconvincing nature of Saturday's 1-0 win over Tottenham was similar in that it showed the scale of the job still facing him. 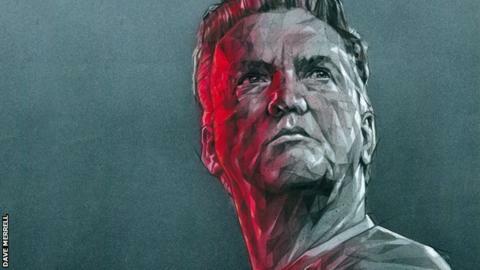 Van Gaal is no longer the new manager on the block but his new-look team have not resolved all of their old problems. And they have some fresh ones to address, too. There is no way the Dutchman can be accused of standing still. Comparing his line-up against Spurs to the XI he picked against Swansea offers the clearest evidence of how much United have evolved under him in the last 12 months. Only four players - Chris Smalling, Ashley Young, Juan Mata and Wayne Rooney - played in both games. And while Van Gaal's 2014 team contained only one of his signings - Ander Herrera - he started with six of them on Saturday and handed debuts to five players in total when you include Bastian Schweinsteiger, who was only fit enough to come off the bench. Van Gaal has spent more than £220m in just over 14 months in charge, and seems to be unconcerned by ignoring his, and United's, long-held reputation for rearing talent from within. United's starting XI v Tottenham was the first time in the 23-year history of the Premier League that they have not selected a single home-grown player for their opening game of the season. The academy products in their first-team squad all appear to be fringe players at best. They were far better at the back against Spurs than they were against Swansea, when the untried Tyler Blackett joined Smalling and Phil Jones in a makeshift back three that was the first of many experiments Van Gaal would try with his defence. This year, United operated with a back four, which was protected well by the axis of Michael Carrick and Morgan Schneiderlin. Smalling looked solid enough as the right-sided centre-half next to the impressive Matteo Darmian, who did well enough at right-back to be picked out by Van Gaal as the best of his debutants. But Smalling's central defensive partner Daley Blind looked less convincing, especially under pressure. His distribution - normally one of his strengths - let him down and it will also be interesting to see how Blind copes against teams who pose more of an aerial threat than Spurs. Realistically, it is doubtful that Smalling and Blind are Van Gaal's preferred pairing for the future any more than Blackett, Smalling and Jones were as a trio. So, the question is will he keep experimenting with his existing defenders to find a partnership that works or will he bring in someone new in the next three weeks. Whatever happens, Van Gaal also has to resolve his goalkeeping situation, which at present appears to be his greatest unknown. Last year, David De Gea was the rock who saved United time and again when their defence faltered. At present, he is so affected by Real Madrid's interest that he is not being considered for selection and watched the action from the Old Trafford directors' box alongside two other out-of-favour United keepers - Victor Valdes and Anders Lindegaard. Van Gaal will not be able to build a true defensive unit until he knows who his last line of defence will be and, again, that looks unlikely to be the current incumbent, despite Sergio Romero's competent debut against Spurs. Robin van Persie was absent against Swansea a year ago because he had returned late from the World Cup. And United were without him again on Saturday, in what is obviously a more permanent arrangement since his departure to Fenerbahce. Against Spurs, their attacking display did little to support the argument that they do not need a replacement striker, or at least attacking reinforcements. Memphis Depay looked lively behind Wayne Rooney, and Juan Mata was neat and tidy in possession. But, despite Ashley Young's willingness to try, all three of United's attacking midfielders lacked the pace and/or the ability to drive at defenders with the ball in a way that could cause Tottenham problems - in the way, say, the recently departed Angel Di Maria does at his best. Rooney himself was effective enough up front but the feeling persists he is better as a number 10, with licence to roam and with an out-and-out striker in front of him. He is good enough to prove people wrong but United will have to provide him with better service than they did against Spurs, when his only clear-cut chance led to Kyle Walker's unfortunate own goal. Van Gaal was right to point out that his side pressing high up the pitch led to Spurs giving the ball away in dangerous areas, but their lack of end product must have concerned him. It says a lot about United's attacking display that they took until the 28th minute to manage a shot at goal and until the 65th minute to get one on target, a low strike by Ashley Young that forced Michel Vorm into his only save of the match. As with United's defence, even if no new attacking personnel arrive before the transfer window shuts at the end of August, a big improvement is needed. A striking similarity with this stage of last season is that it does not appear Van Gaal knows his strongest XI yet. This time it is because of the number of signings he has made rather than because he is still to assess the players he inherited. But it is also still the case that more acquisitions look necessary if United are to have a chance of being champions again for the first time since 2013. Van Gaal has the funds to make those purchases, which might sound like a positive on paper, but what happened in August 2014 should serve as a huge warning that expensive new recruits might not be the answer. Di Maria, for a British record £59.7m fee, and Radamel Falcao, who cost £6m to loan and £265,000 a week in wages, both arrived after the opening day and both have already departed, to be remembered as expensive flops. United cannot afford any more dud moves. They are off to a winning start this time, but they are still a work in progress and Van Gaal has some big decisions ahead. He has to get them right, because the biggest difference to 12 months ago is that he is expected to mount the title challenge that failed to materialise in his first campaign in charge.